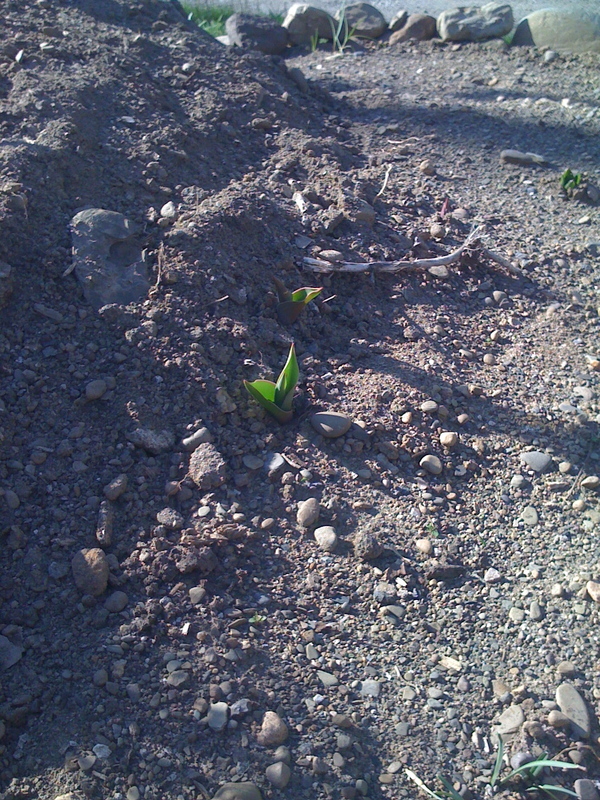 New growth, Composting, and Finally a Tulip. | EAT MY PLANTS! A friend of mine that also tends raised bed gardens for food also has a nice collection of ornamental plants. I’ve been meaning to bring my shears over to ravage his Montauk Daisies. Every very, late Fall he has this big bush of gorgeous white flowers with yellow buttons in the middle. So, the other day I clipped a bunch off. 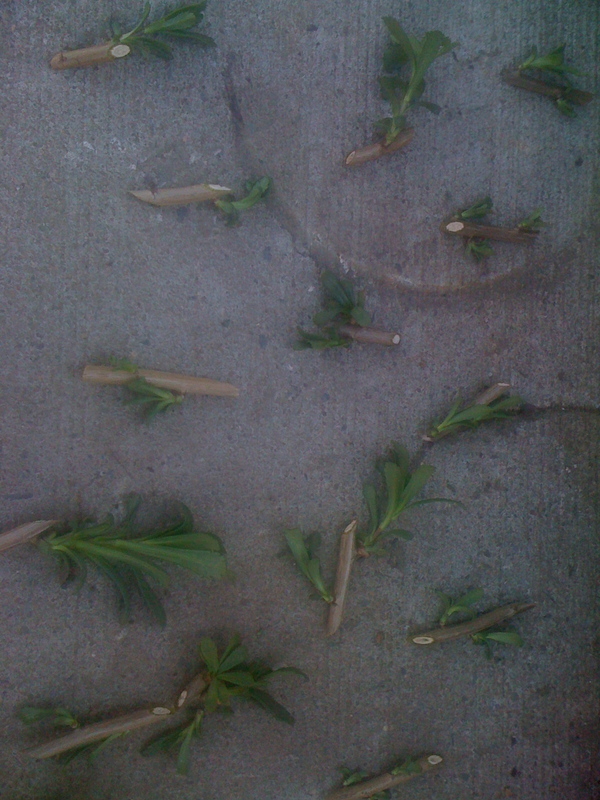 After I got home, I clipped the Montauk Daisies into little slips each having a green piece on them. Which, by the way, these smell pretty strange when their cut. Like a cross between a skunk and a burning tire. Anyway, I really had no idea of this was going to work. 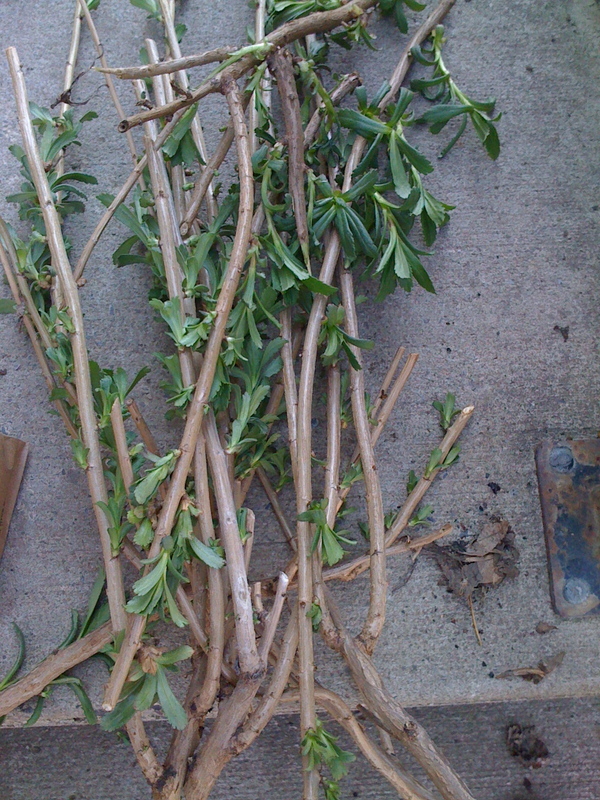 I know I can take Privet Hedge and just stick it in the ground and 90% of them will root. I was banking on this being the case with these since I was lining my driveway with them. 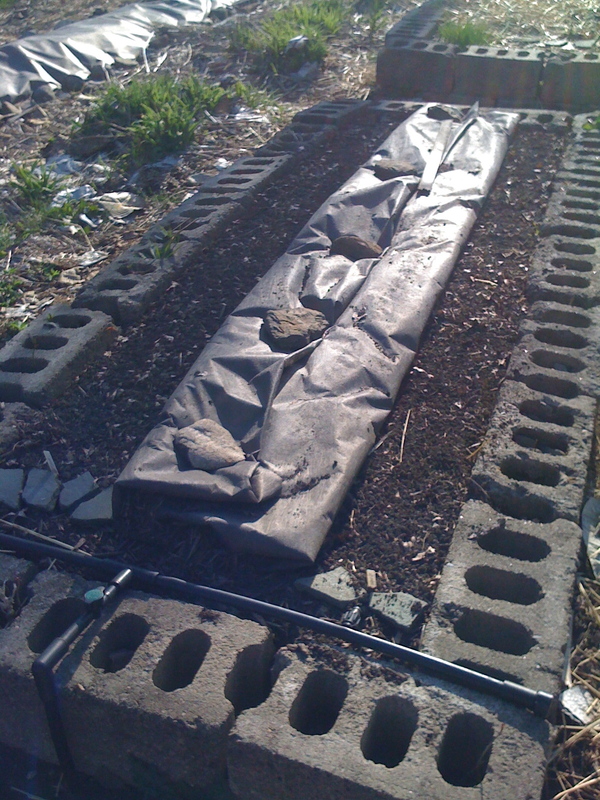 I placed each slip into freshly worked soil and promptly watered them. 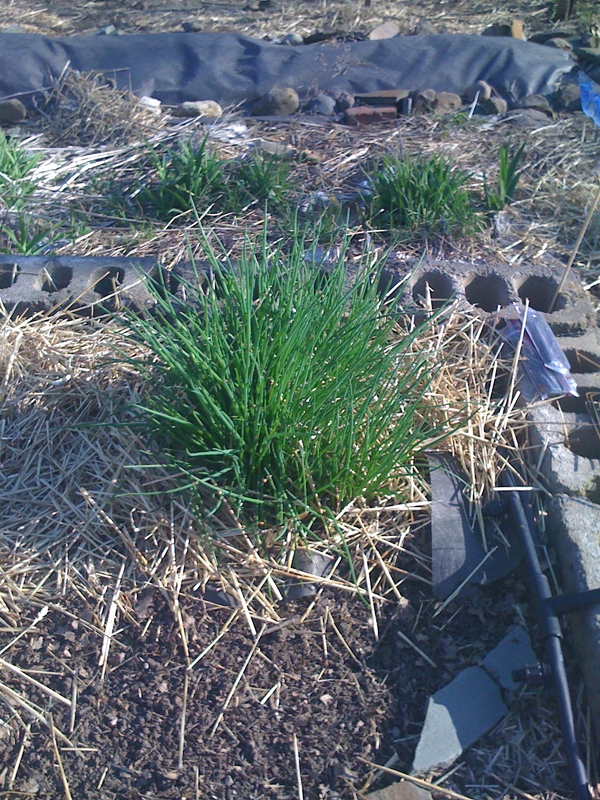 They prefer well draining soil and once they are rooted, they require very little to no maintenance all Summer long. 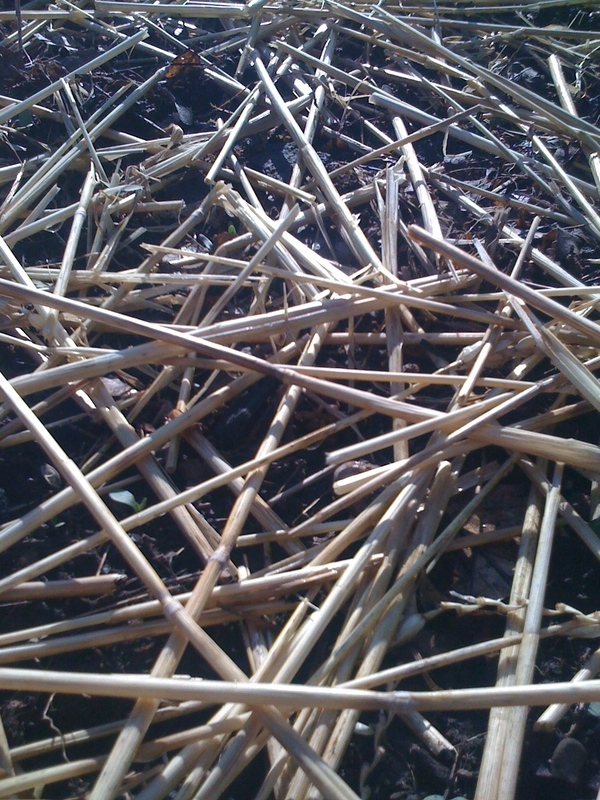 At the end of the Winter season, when the flowers are gone, you simply cut back any dead stems to make way for new growth. 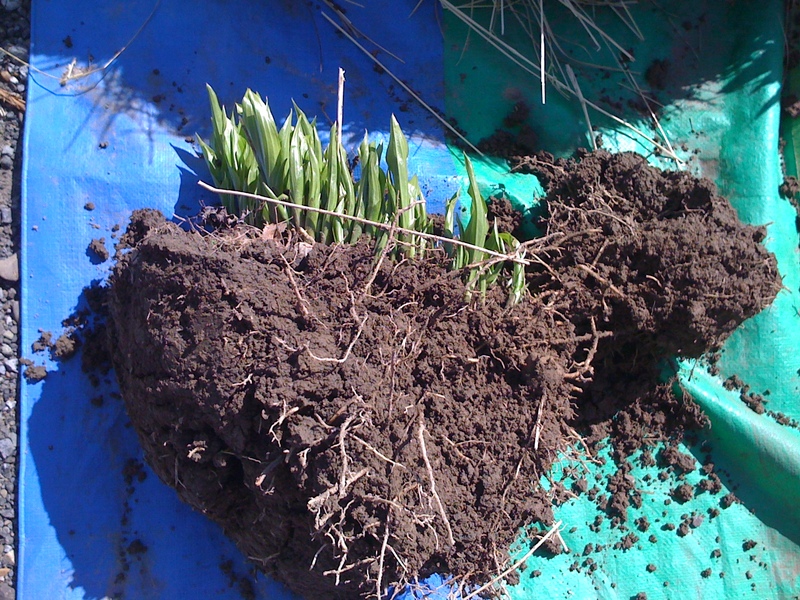 Right after Crocus are dying back these will start to get green again. Pretty early. While at my friends getting the Montauk Daisies, he had to cut back some Iris that had encroached the lawn so I was the benefactor. I immediately separated them and got them around the beds, the back patio, and I could still use more. These are purple. In addition to the Iris, my friend had to thin some Hostas as well. I got to bring them home and I definitely had room for them. SOLVED! Remember the mystery flower? Well it’s starting to get ready to seed. I am watching carefully. I learned that this is called, Erythronium Americanum. 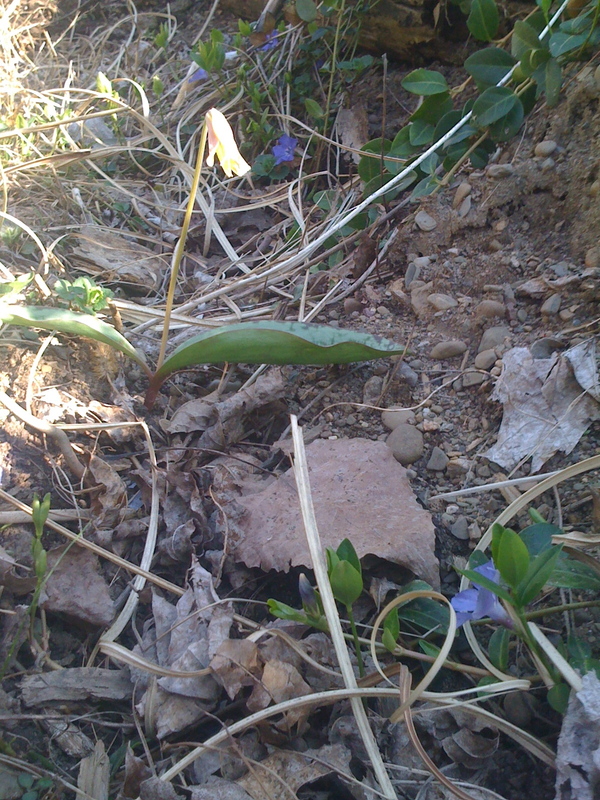 But it’s common name is the American Trout Lily or the Dog Toothed Violet. You can actually eat the root corns. 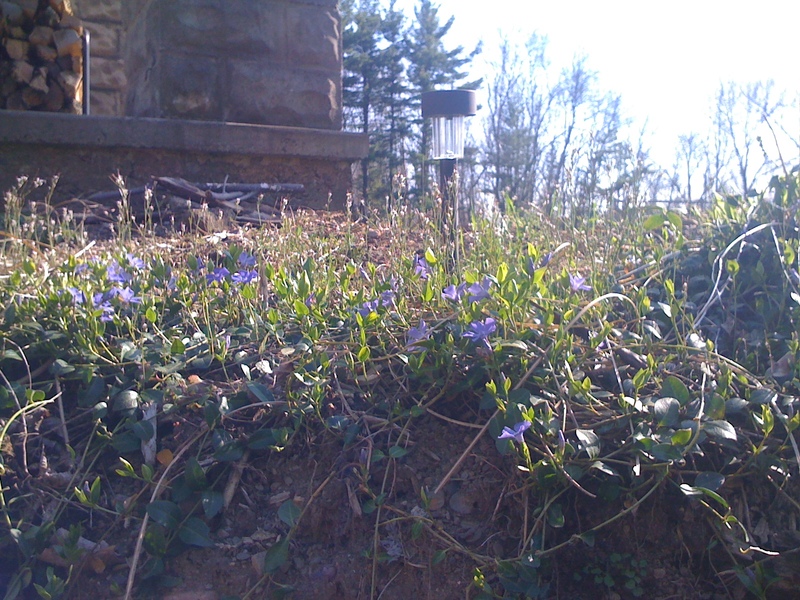 The vine in the front bed is full of purple flowers still. It’s been about a week now. The Tulips in the front bed are so close. We planted so many of these this Spring, but I wasn’t sure what we’d see this year. Sometimes you don’t see them until the second season after planting. The Snow Drops have now created these seed pods and are slowly dying back. I’m curious how many we’ll see next season now that I know how they propagate themselves. 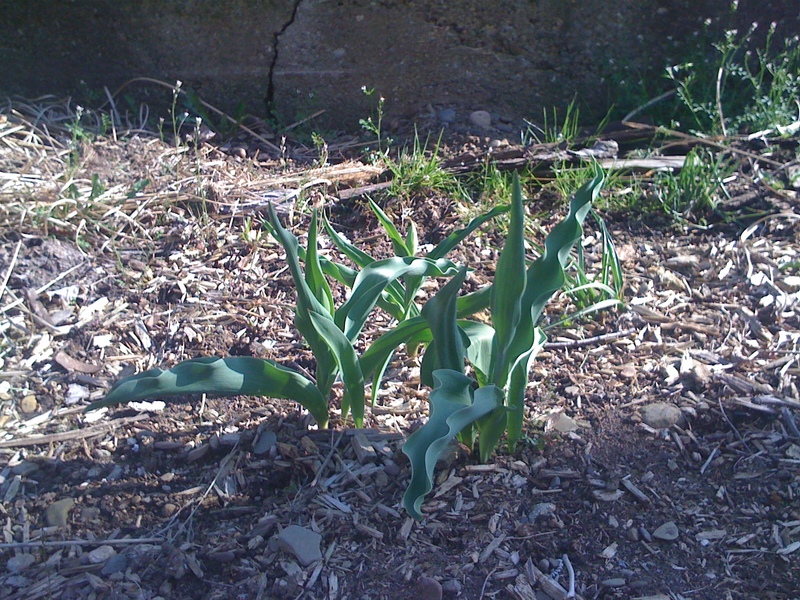 Here are a couple more Tulips from this new batch we planted. This corner of the bed has at least 30 bulbs in it. The Queen of the Night are the ones I am most excited to see. From what I’ve read, these won’t come up until sometime in May and when they do, it’s a short life. 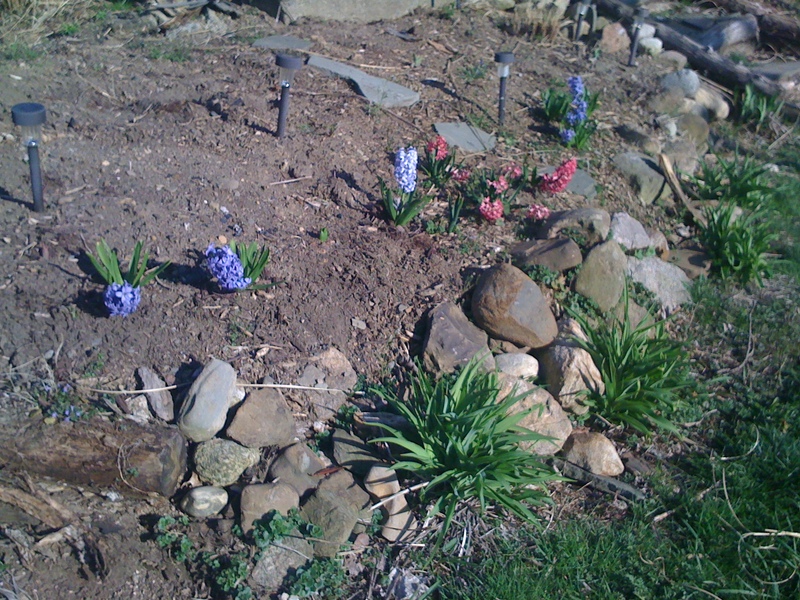 The Muscari or Grape Hyacinth are looking so pretty. Last season I thinned them and spread them around the whole bed. Now they’re all coming out. 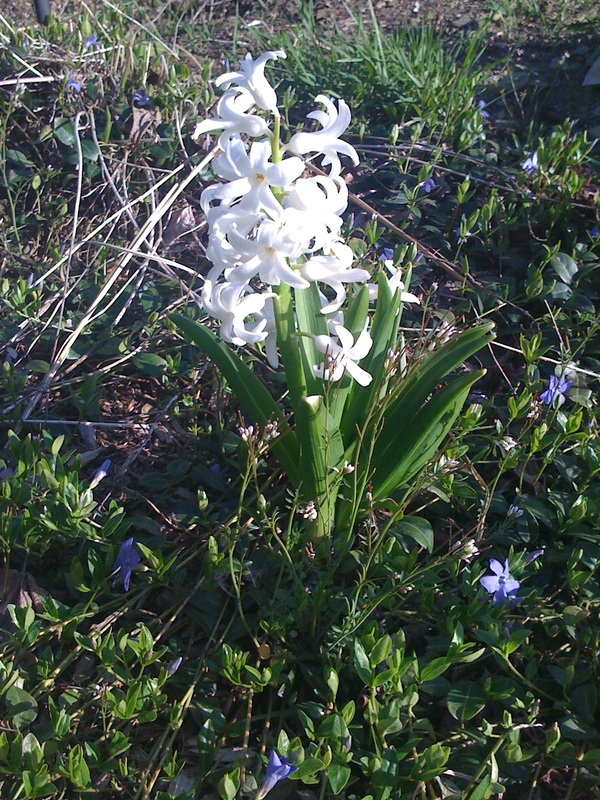 Some of the Hyacinth fell over so those got cut and brought into the house. Wow, they smell great. Some others, like this white one, are still quite strong. There are so many bulbs in this bed that are new and haven’t come up. The ones that have look wonderful. I would really like to see how well these do next season. The local nursery knows that if they put a flat of flowers outside by the door, some schmuck, in this case, me, will break down and buy them. 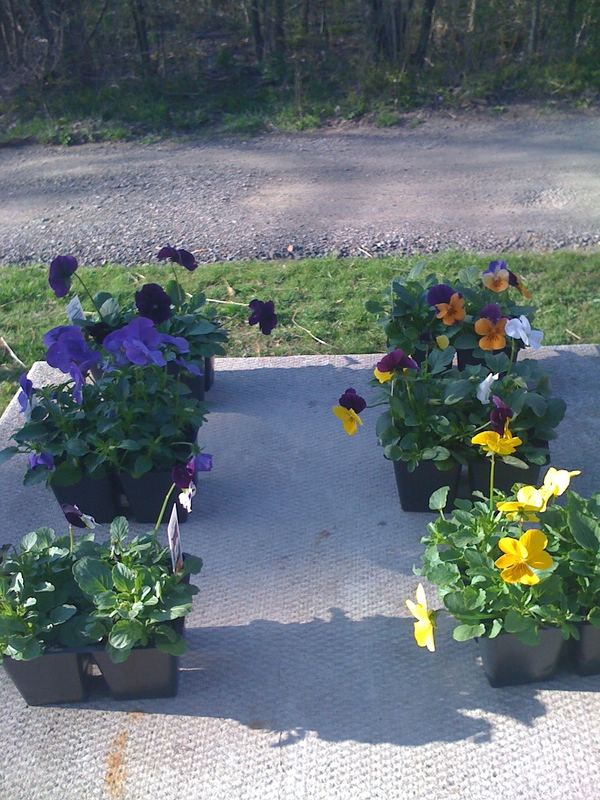 I mixed some Violas to put in the front bed. While a lot or my flowers are later than other people, that also means a lot them are in bloom later, too. 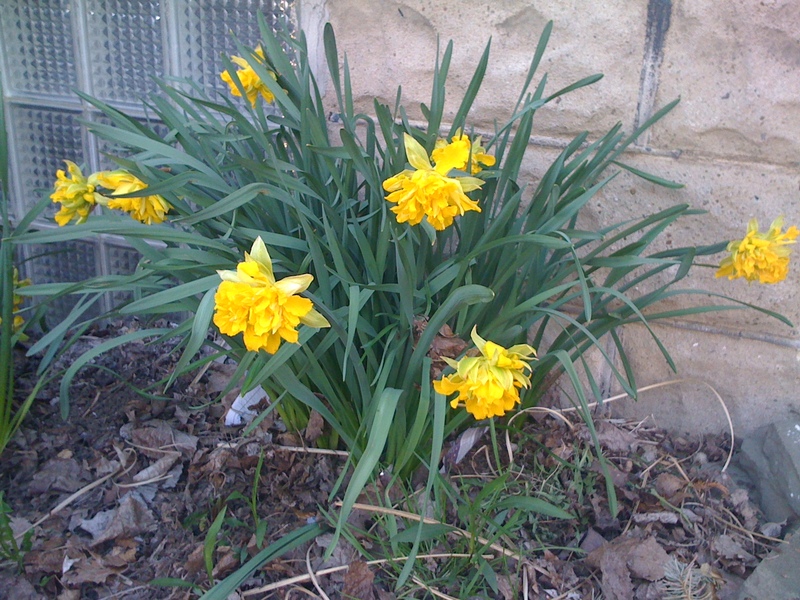 My Daffodils are peaking. 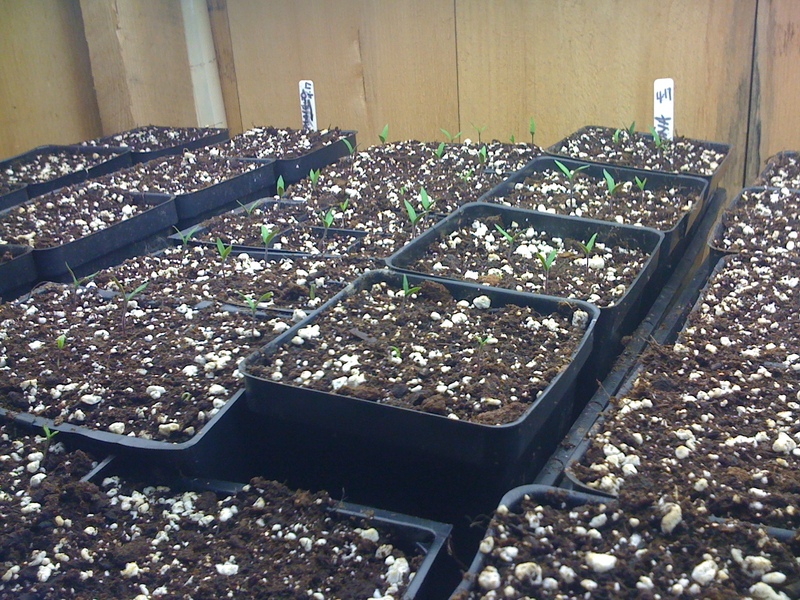 Here’s a look at the Snow Peas. They’re about 2 inches tall this morning. I have to prepare some way to let these climb. In just days these are going to be looking for something to grab on to. Sort of a tough picture to really make anything out. If you like the Where’s Waldo pictures, you’ll enjoy looking for the Swiss Chard coming up. 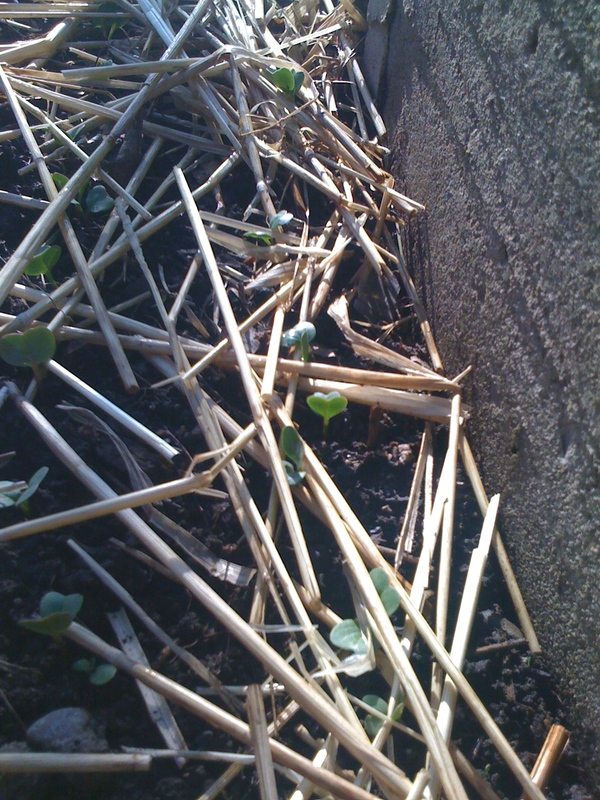 The Radishes are getting stronger and should probably be thinned a little now. Maybe tomorrow. Look closely. The Lettuce is up. In a few days I’ll thin these a little bit also. My friend that I mentioned earlier, doesn’t plant his Lettuce each season. 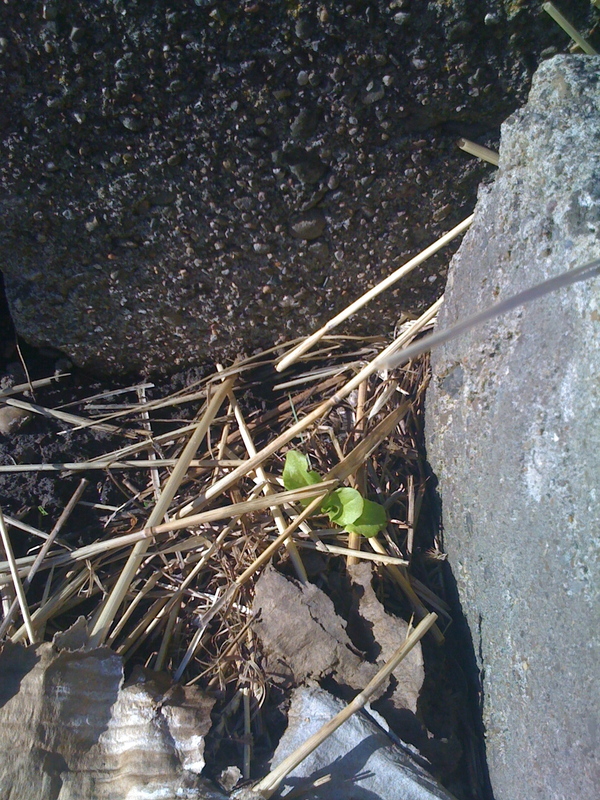 It simply reseeds itself each year. 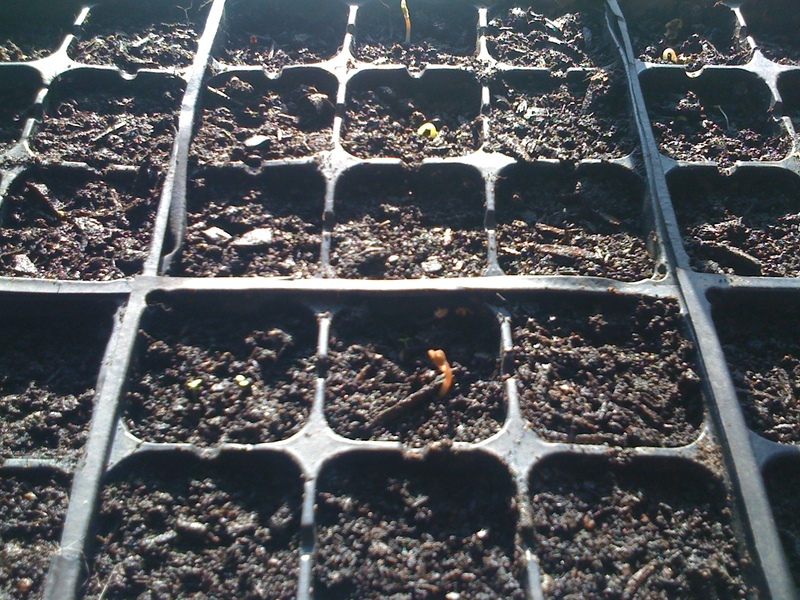 I collected seeds from my Lettuce last season, some of those seeds fell on the ground and here they are. I’m tempted to leave the Lettuce that fell on the ground for a little while. 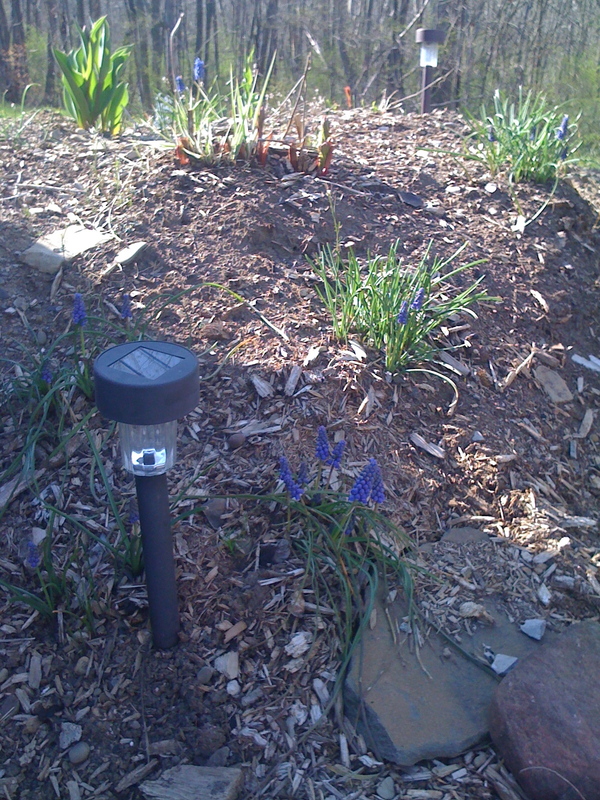 I took the Iris that my friend gave me and started another garden area to help hide those nasty cables and meters on the house. 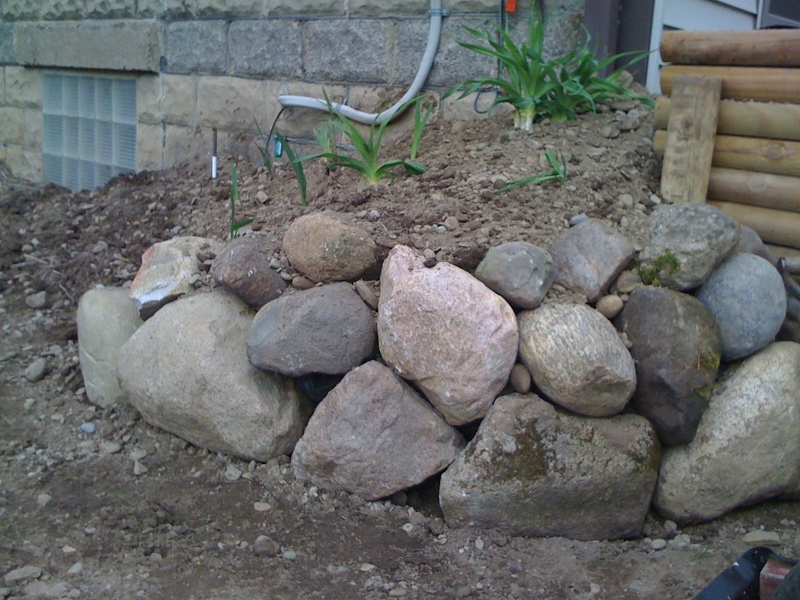 I have so many ton of field stone, river rock, and boulders but I still need a lot more to do what I want. If I had as much as I really wanted, I’d be making stone walls like you see in Vermont. I used to get a lot of stone from a local vineyard. I might see if I can’t get back in those fields. 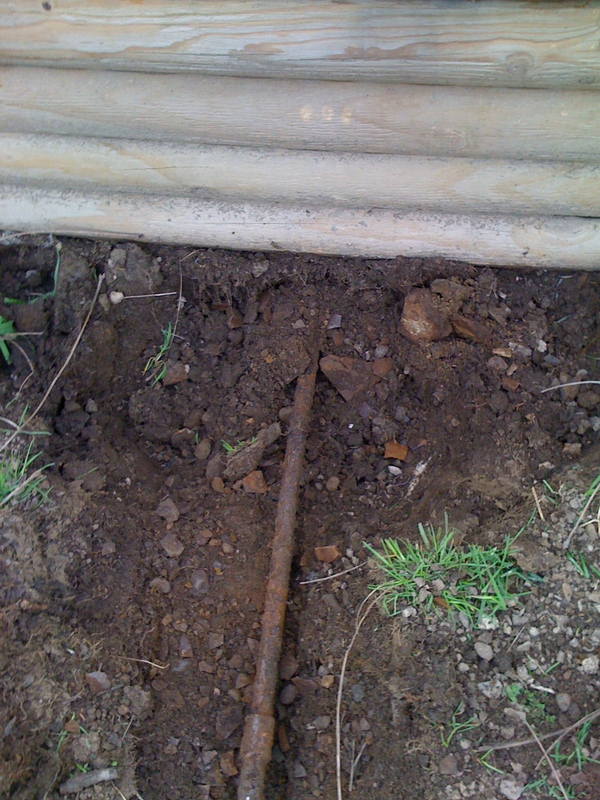 While I was preparing the site for burying posts and putting that little stone garden with the Iris in it, I came upon a pipe in the ground that runs underneath the patio and off into the yard. I know that this pipe is dead since all the services in my place are new when we built it. However, where my garden is currently located is where a pole barn used to be. This is running in that direction. So, I dug out several feet of that mystery pipe. I might just cut it off at this point and leave the rest buried. I don’t care to know how far this goes. If it actually goes as far as the garden site, I have 20+ feet to go and I’m not digging up the garden area. 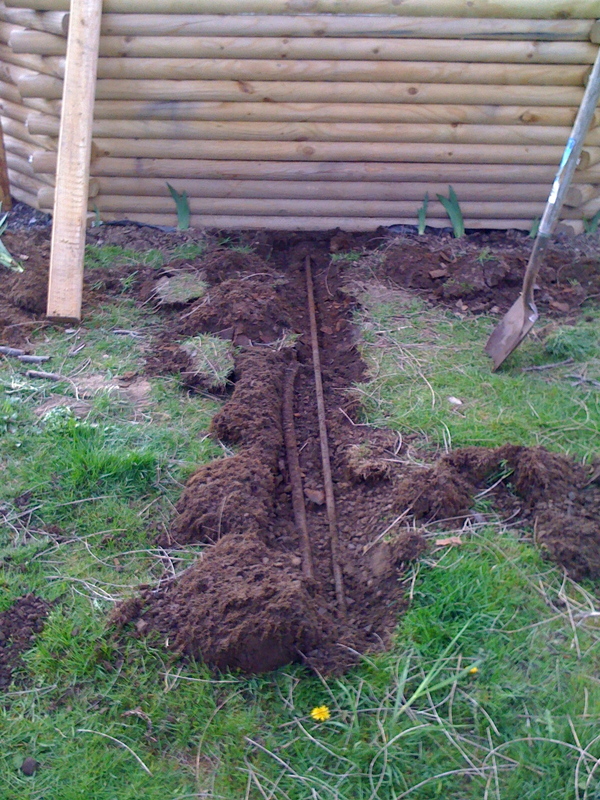 On the other side of the patio, about 35 feet away from the mystery pipe, I was digging another hole for a post. Guess what I found. Another mystery pipe. But this time it’s running next to another pipe. Yay! As you can already tell, I went back about 10 feet or so and I’m thinking of just cutting them at this point and leaving them buried. These are running in the direction of an old well I filled in when I first bought the property. You might remember a couple posts back my mentioning my compost and that I basically use the laziest method of composting. 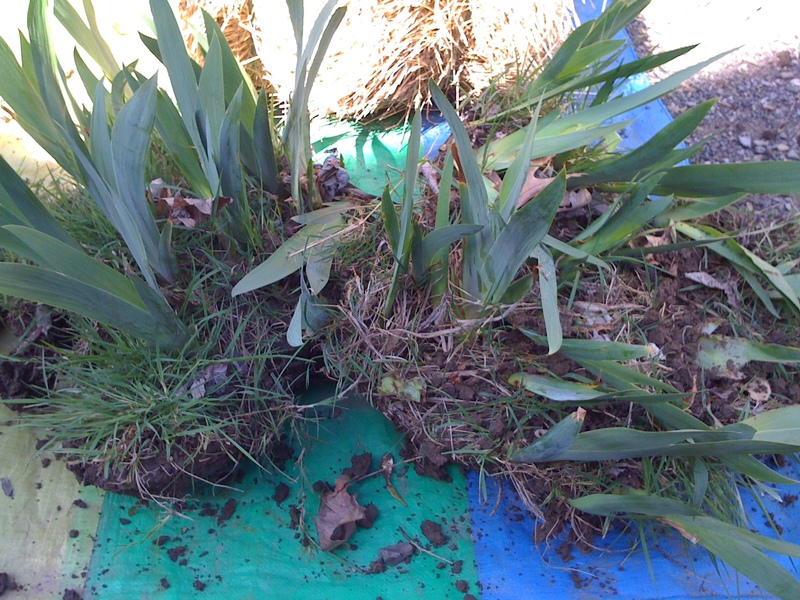 While throwing the scraps and browns into a pile does indeed create excellent, nutrient rich soil, it takes almost 2 years to do it. What’s better is turning it over and making sure it stays warm. What’s even better is tumbling it. Since tumblers are actually kind of pricey and I haven’t built a couple of them yet, I needed a better method right away. 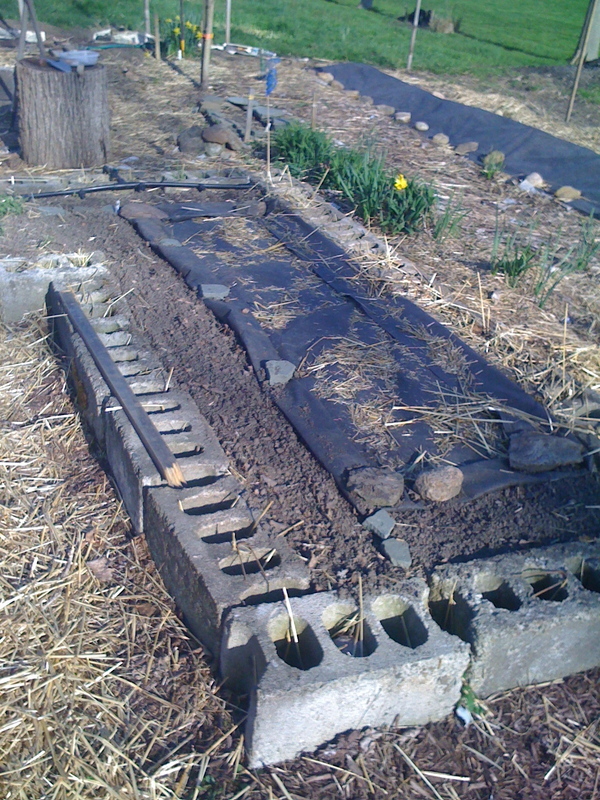 I’m missing out on getting my compost into the beds sooner. 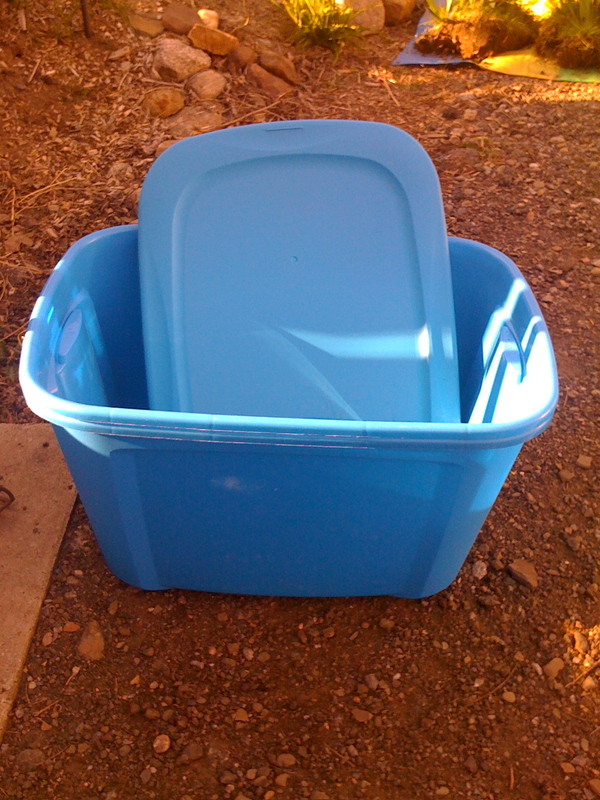 I went to the local value store and bought 2 large bins and drilled holes in the bottom and sides. When one bin gets filled I’ll start filling the other while turning the first one each week. 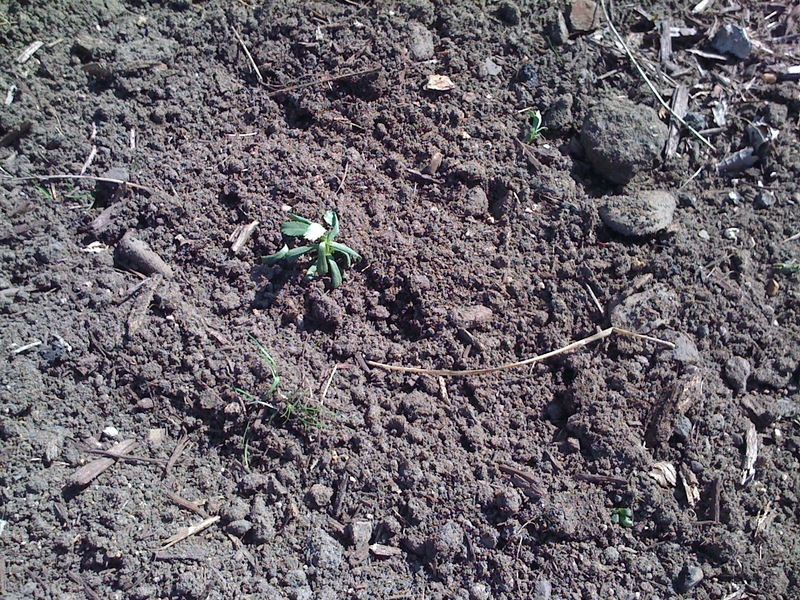 I can get soil as quickly as 4-6 weeks. I put both the bins in the garden. 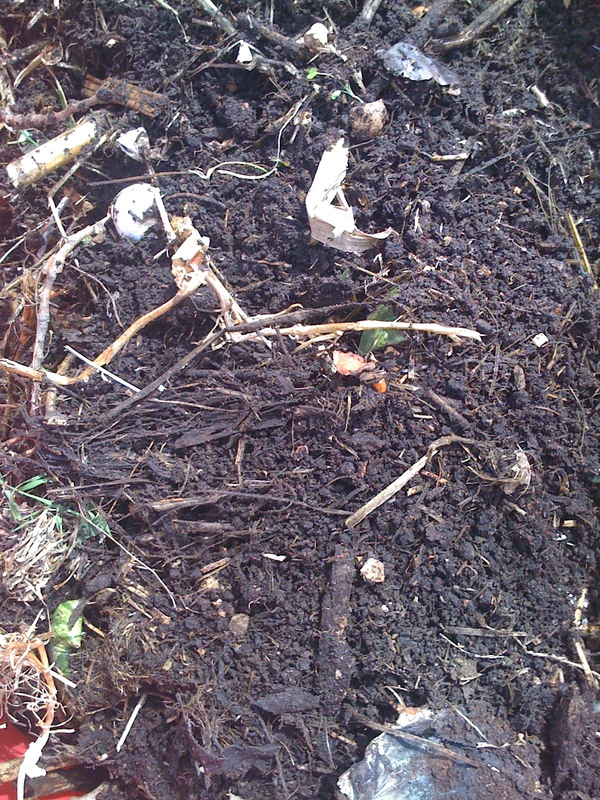 I went back over to the old compost pile and turn it over. 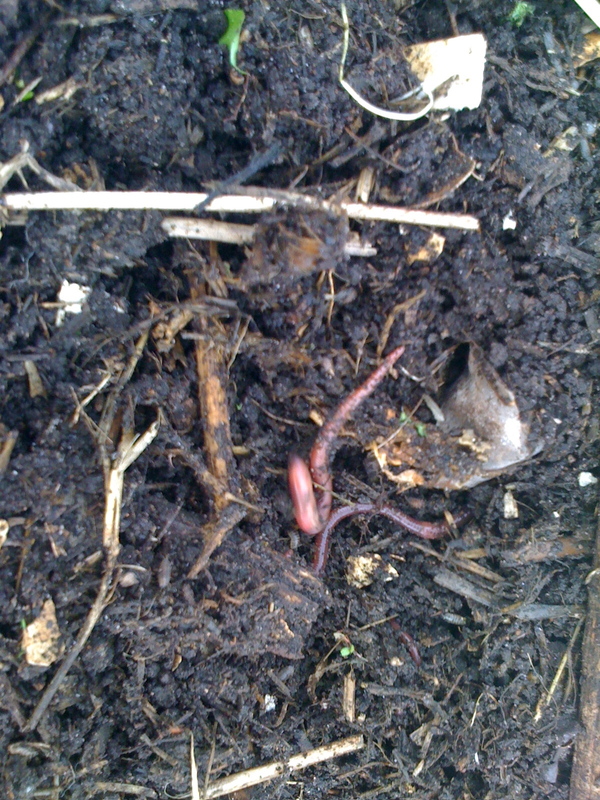 It was full of worms and many other little creatures working their butts off. I filled the big garbage can and the large bin after drilling holes in them. Mmmmmm….worm poop. Look how rich this is. 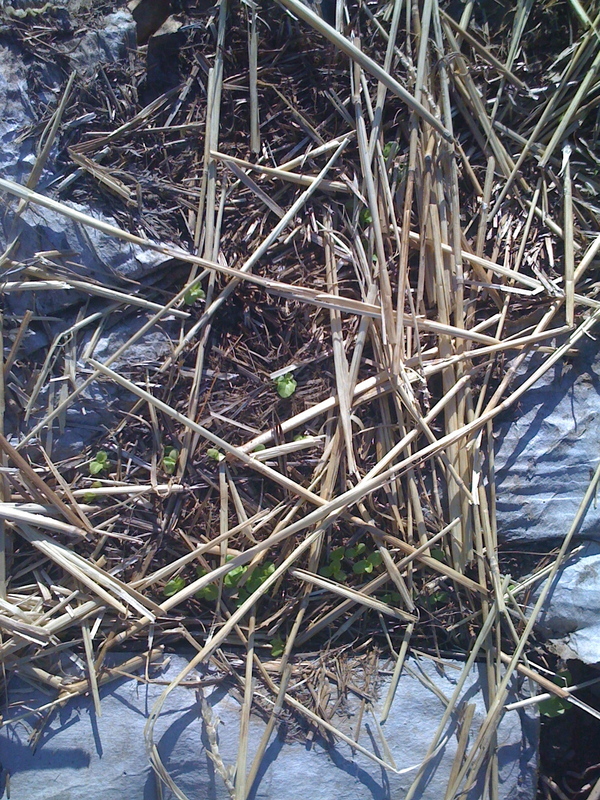 Those little guys did such a great job on the compost pile. I have a lot of it, too. It’s very close to being ready. 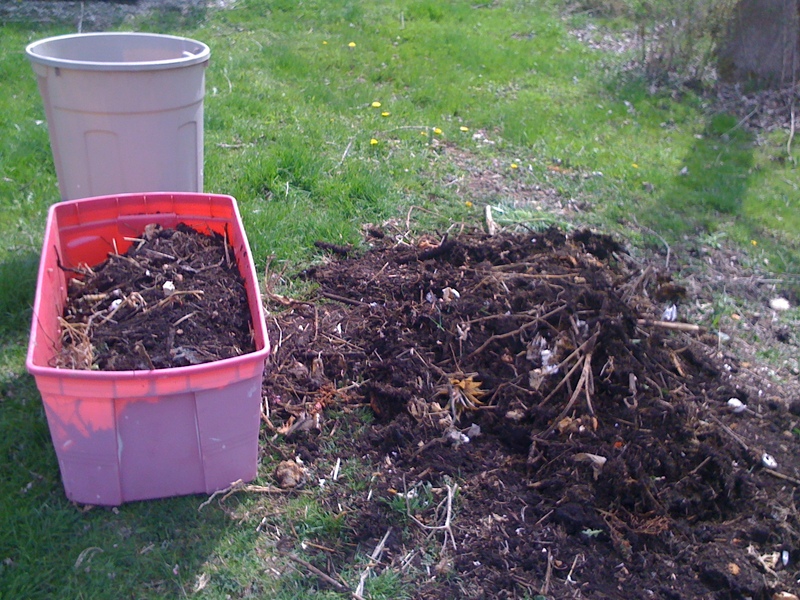 Here’s another look at the compost pile and what it turns in to. See the worms hard at work? I did sort of feel badly when I started turning it all over and shoveling it into the bins since I know that’s probably the last thing these creatures were expecting today. 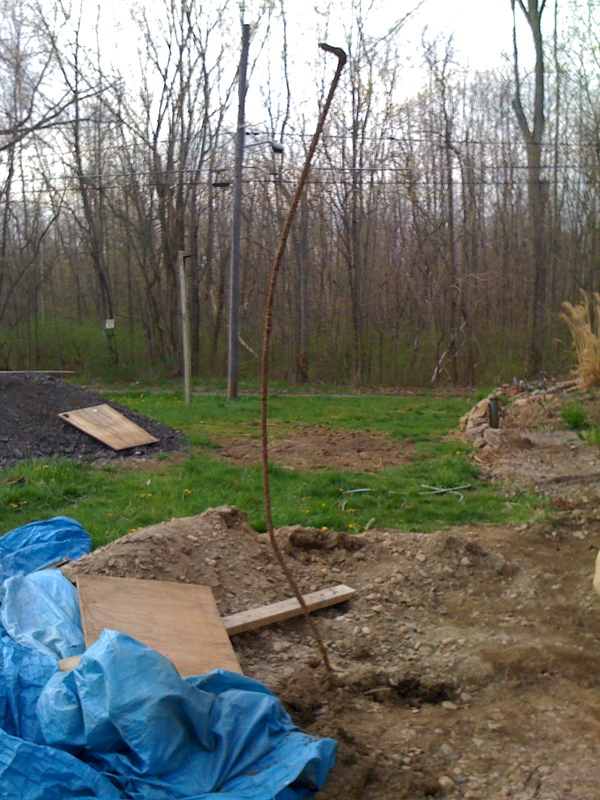 Where the pile used to be I transplanted some Raspberries from another part of the property. They’re gonna love it here. One of the plants I harvested seeds from last season was Nasturtium. I planted 60 or more of them and in only days they came up. Usually soaking them overnight in water to soften the husks makes them come up quickly. However, the husks on a lot of these were very dry and crispy. I was pleasantly surprised to see them popping up as soon as I did. I’ll post about Nasturtium later, but if you don’t already know and haven’t googled it yet, this is a pretty flower that not only sparks up the garden with beauty but it’s tasty too. It has a peppery taste and works well in salads. There are plenty of recipes online for stuffed Nasturtium flowers, Pesto, Vinaigrette, and others. Watch for a future post about Nasturtium and why I keep growing them every year. Over in the shed, the Tomatoes are up! Amish Paste, Gilbertie Paste, Roma, and Matt’s Wild Cherry. In a couple days I’ll be starting the selection process. 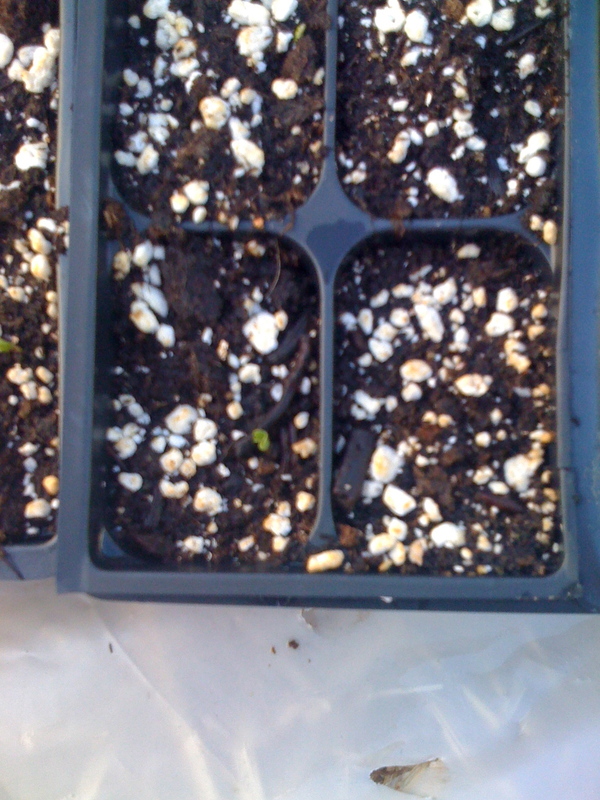 At the time of this writing, one of the Jalapenos came up, too. I’m still waiting to see Yellow Hot and Purple Sweet Peppers to come up. Here’s another look at the Tomatoes. Every time I go into the shed for the first time each day, I get a little bit excited to see how much bigger these have gotten. 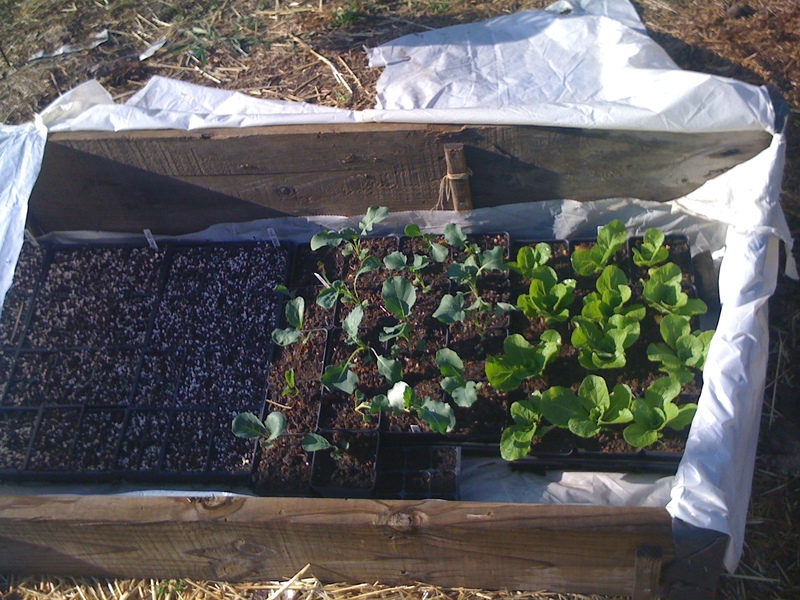 I had to move the Cabbage, Broccoli, and Cauliflower to the cold frame and those are doing very well. I can’t be certain that we won’t get another hard frost. Our average last hard frost date isn’t until May 15th. 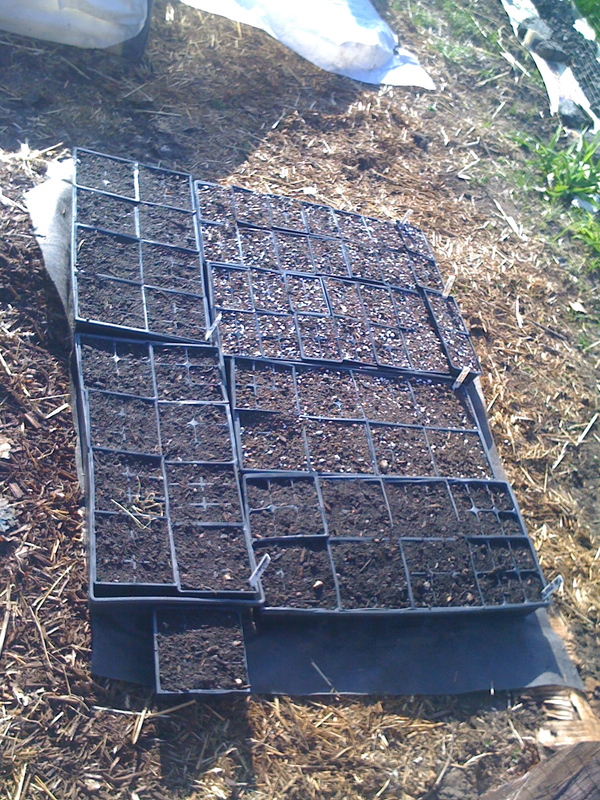 So, each day I open the cold frame and don’t close it until evening when it can warm up a little bit for the overnight. Remember the 96 Kale seeds I started? Here they are already. So cool. We use Kale every morning in our juice. It’s a super food. Of course, I’ll be writing about Kale at a later date. It’s my intention to dedicate a single post to everything I grow. Since there’s no frost due for several days I started some more seeds. These flats have Pyrethrum Daisy, Shasta Daisy, and African Daisy. The Shasta Daisy are to help attract predatory wasps and insects. The African Daisies are for good looks. The Pyrethrum Daisy is to help fight off some pests and they look really pretty. They’re kind of pink. They are in the Chrysanthemum family. What’s so magical about these Daisies is that Pyrethrum is natures insecticide. Much safer than spraying chemicals all over the place. 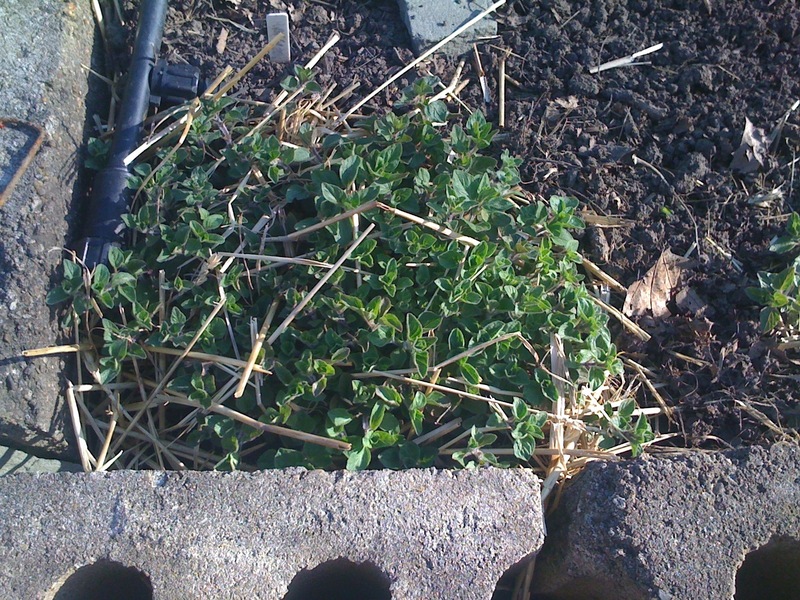 The Oregano is doing very well since it’s getting warmer and the days are getting longer. 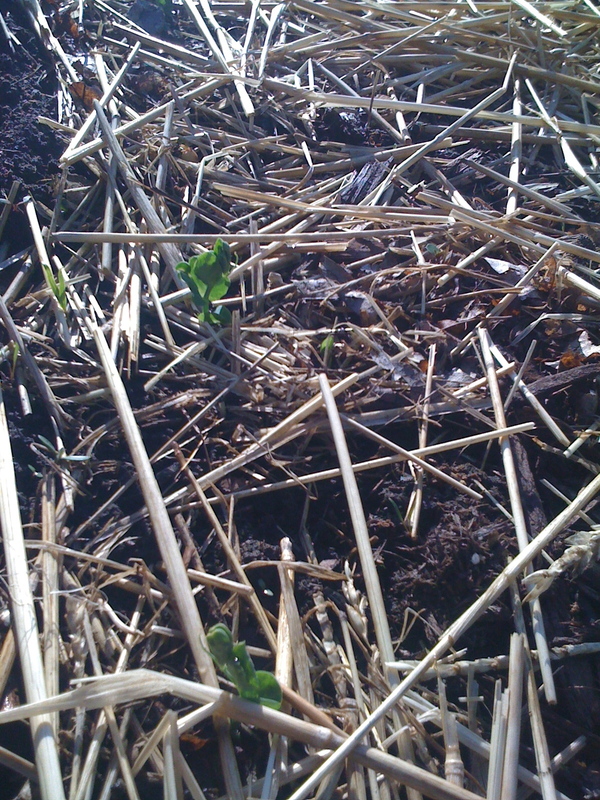 At the base of this bed are Snow Peas. Up the right side is Lettuce. Up the left side is Carrots. 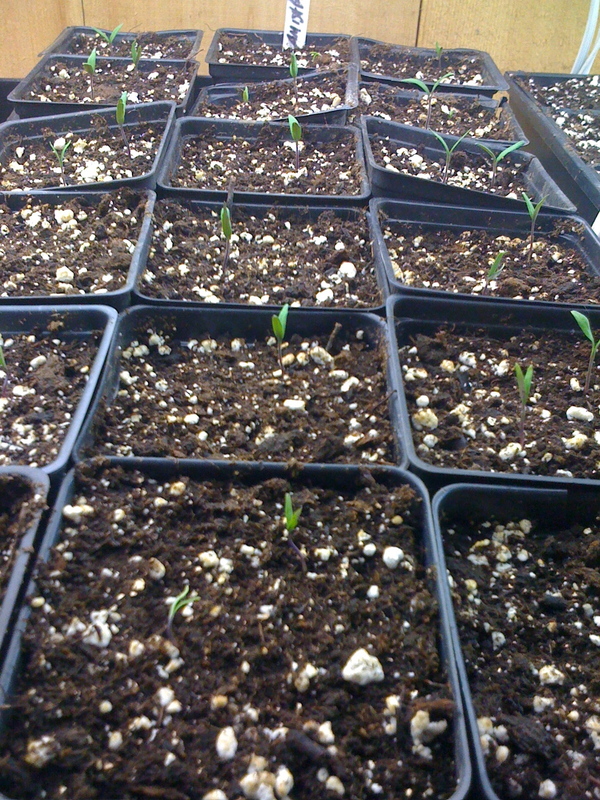 The middle is being reserved for Tomatoes and Peppers most likely. 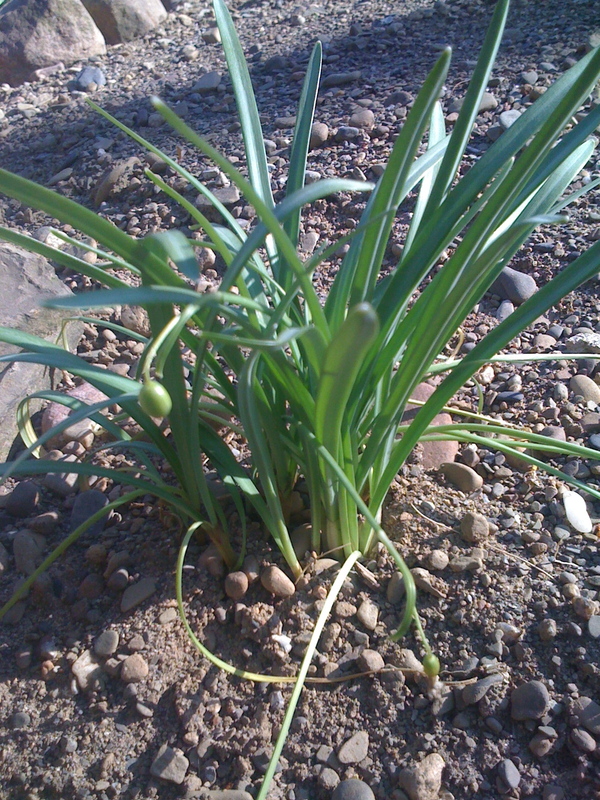 It’s about time we start eating some of that Onion Chive. If we don’t keep hacking away it will just start flowering. Even though the flowers are really pretty, these are better use to me in a salad or something. In the foreground, I am still waiting for the Spinach and Cilantro to come up. 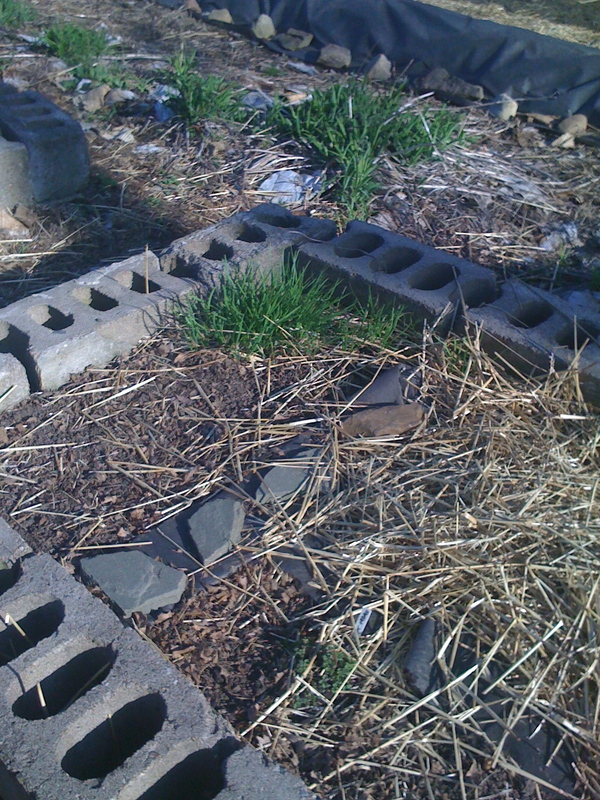 In the other corner of the same bed as the Onion Chive is the Garlic Chive. This is the first year so it’s not as thick and full as the Onion but I’m impressed at how much there is already. In the foreground is the Hot Oregano, Lettuce, and to the front, left of the bed is more Spinach. The rest of the bed is reserved for Tomatoes and Peppers, most likely. I have 2 of these square beds. 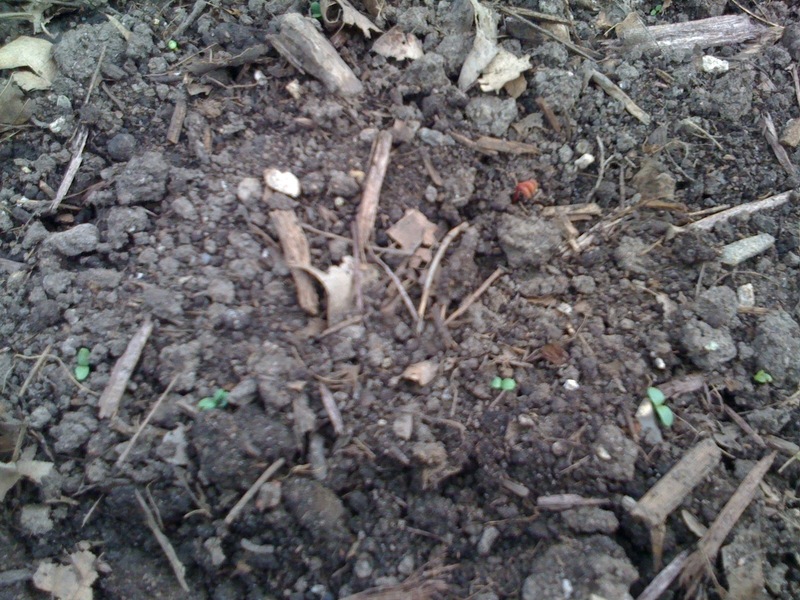 You can clearly see the Snow Peas coming up but there are Carrots, Swiss Chard, and Radishes that have all broke ground, too. 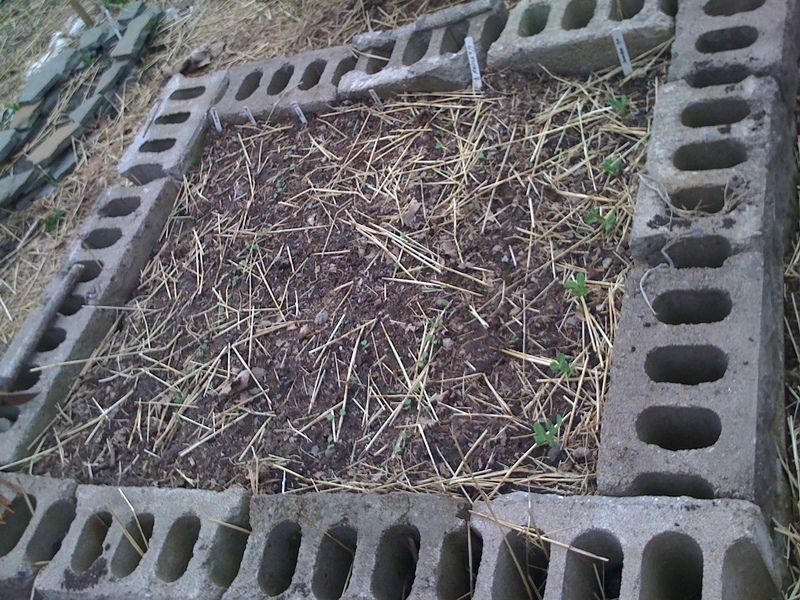 I had extra Snow Peas so I stuck them in the holes around some of these square beds. Snow Peas seem to grow like weeds for me. So I’m expecting lots and lots of them. 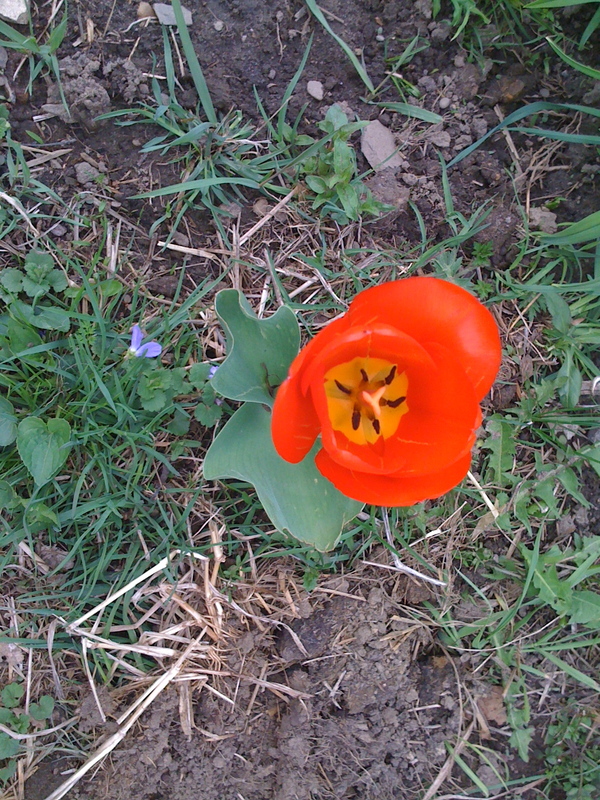 Last but certainly not least, here’s the first Tulip of the season for us. Look at how brilliantly red it is. 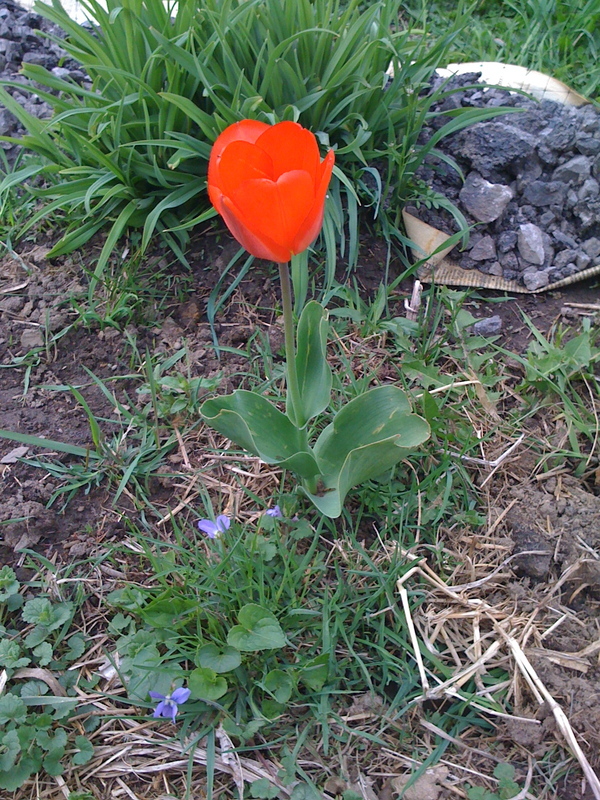 Finally, a Tulip the rabbits didn’t get. This one is in the garden area though. Very well protected. Inside the Tulip is a little, yellow ring with black pistils. I might be a bit biased since this is the first one of the season for us but, this is a fine specimen.